Does this ever happen to you: one moment you’re folding laundry and the next moment, you find yourself jumping with two feet into a project that you had no intention of doing that day?? This happens to me allll the time! You get fed up of looking at something and feel an overwhelming urge to drop everything and just GET.IT.DONE! You know that if you don’t do it when the mood strikes, it will never get done. This happened to me last weekend as I was doing my Saturday morning vacuuming in my office. Every morsel of dust and dirt were sucked up. Yet, I couldn’t stop fixating on my nasty, stained desk. I had been meaning to do a “desk refresh” to spruce up my office, but the desire just wasn’t there until THAT.MOMENT! 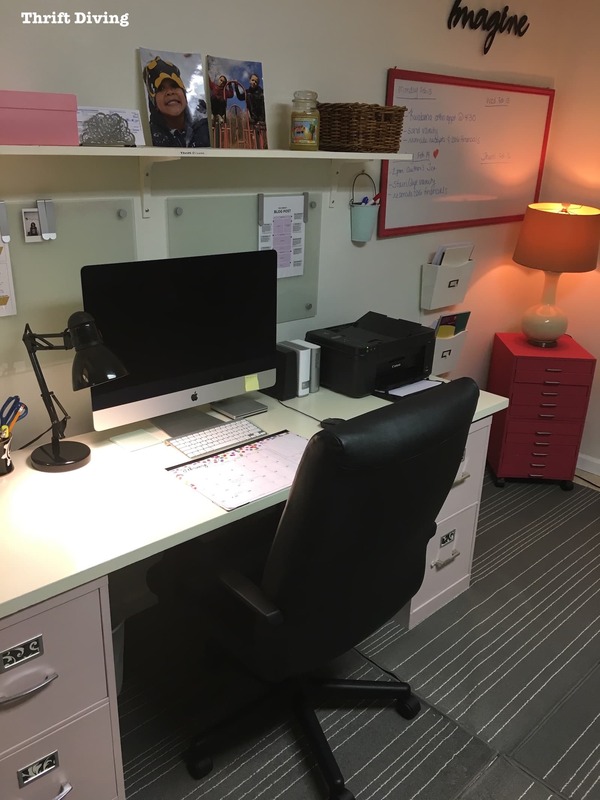 This office is the space I made over for our Junk-Free January Room Makeover Challenge (a challenge where my readers and I commit to transforming a room in only 30-days). 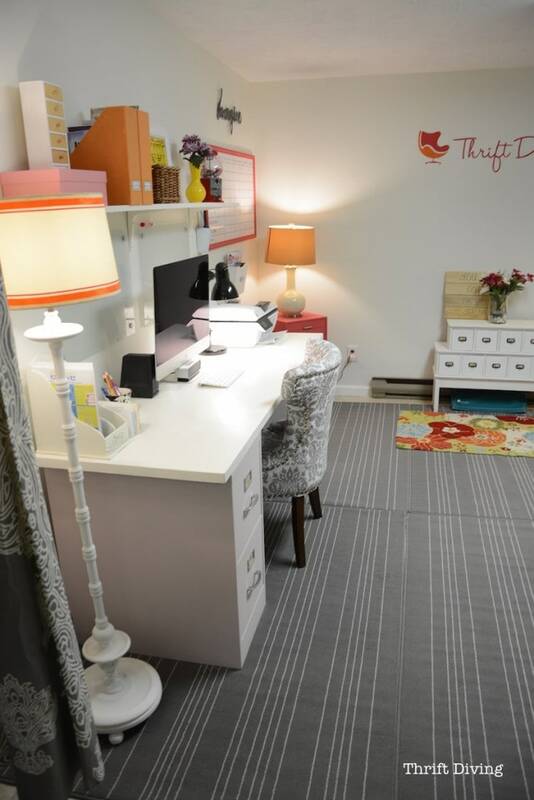 After my 30-day room makeover challenge, my office turned into a pretty, colorful little sweet spot in the basement, where I could write my blog posts! I absolutely loved it! I still do! And for the most part, I was able to maintain the prettiness. 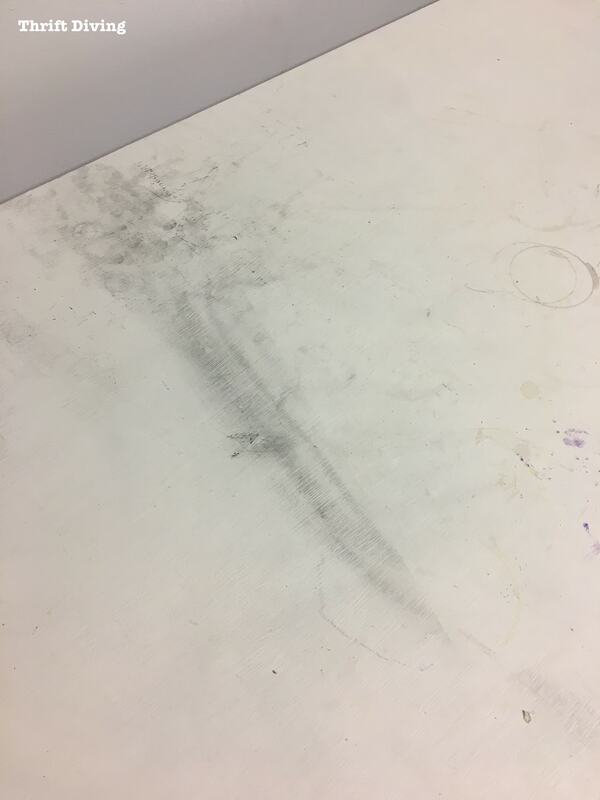 But after two years, the desk took a nasty beating. 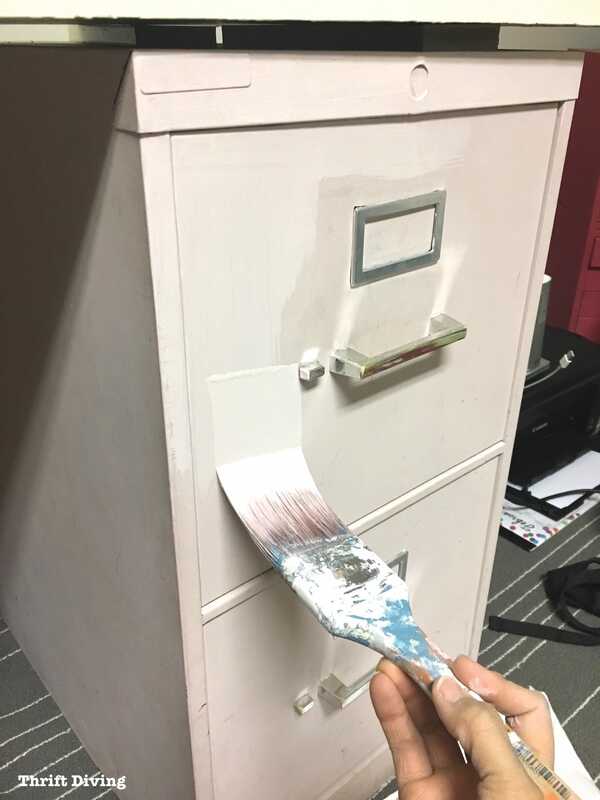 And the file cabinets were equally scuffed. Suddenly, I found myself not being able to think clearly when sitting at that cluttered, disorganized, dirty desk. Where was my pretty office?! So that weekend, my DIY inattentiveness got the better of me and all routine cleaning chores went right out the window! 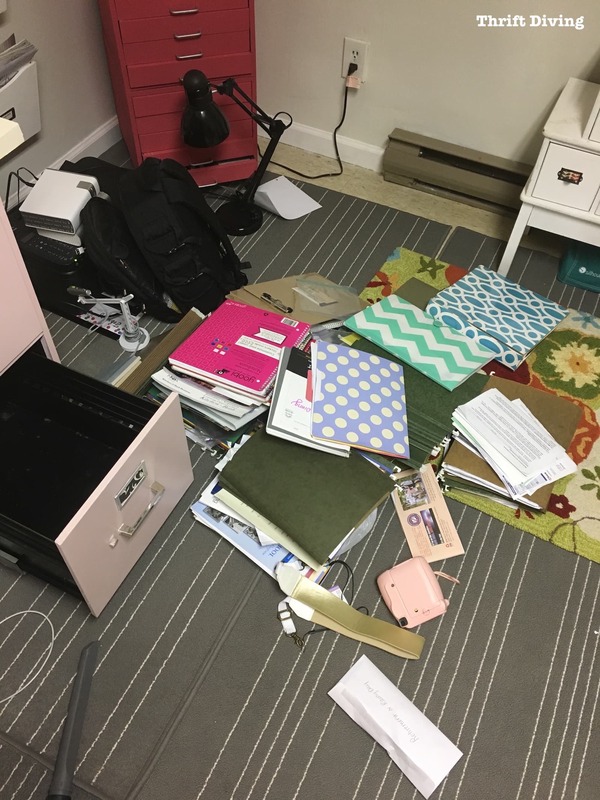 And I started to think about you guys: how many of you have desks that are cluttered, dirty, and disorganized, too?? Likely, many of you do. That’s why I wanted to challenge you to spruce up your desk, too! 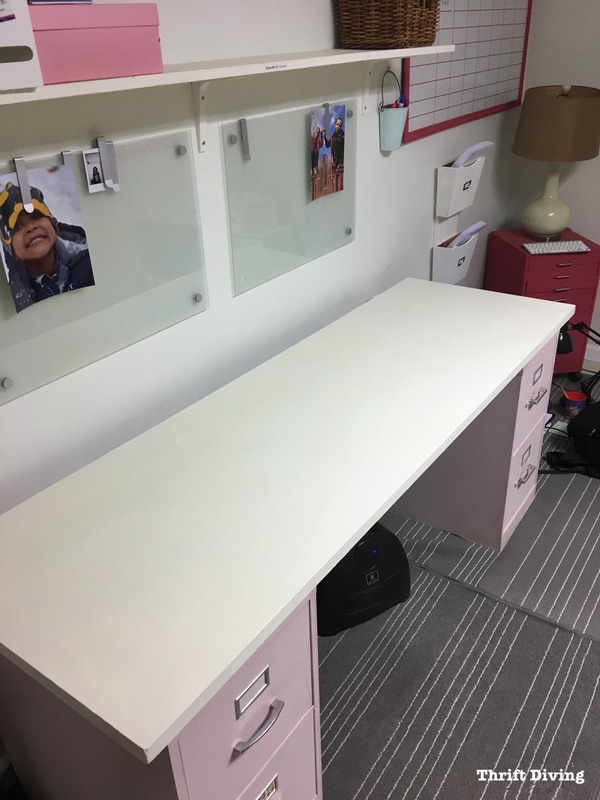 And the goal with this mini “desk fresh” is to get it done quickly so that you can get back to doing the other important things you’ve got going on in your life! 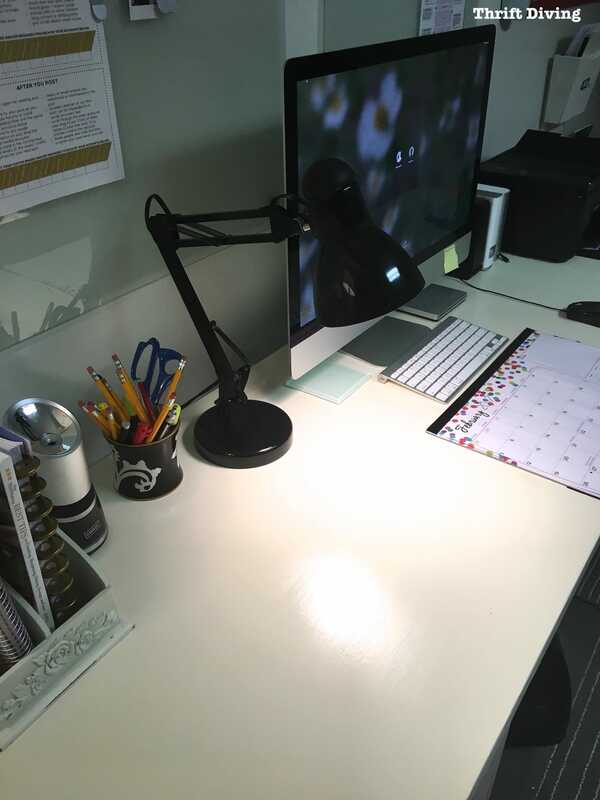 If you’re not sure where to start, these tips will help you help you spruce up your desk, too! 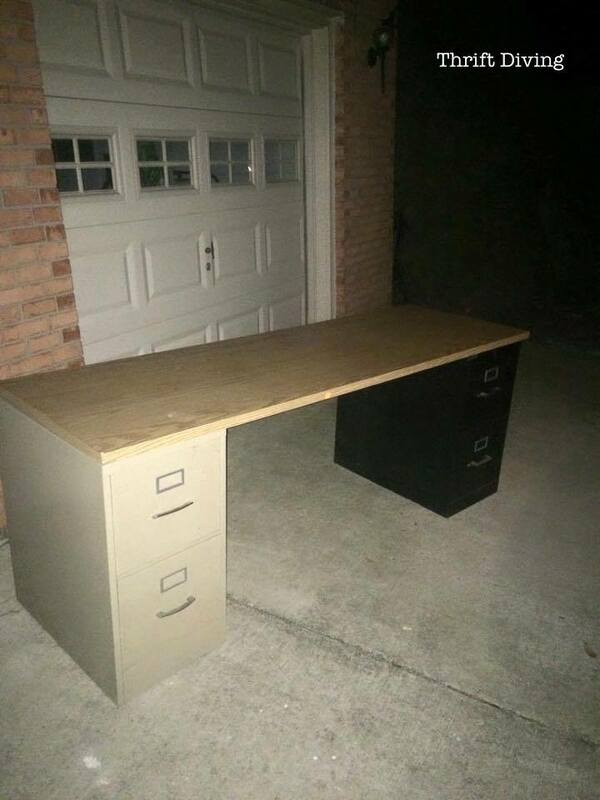 STEP 1: Clear absolutely everything off your desk! Go ahead and toss everything on the floor or into a box or something. Don’t even think of starting with one pile and working your way through everything on your desk. You’ll never get anywhere doing that. And remember, you’re trying to do this quickly. Just remove everything, even your computer. Hot, soapy water is always my “go-to” when I clean things. But I usually keep Spray Nine on-hand because it’s a great heavy-duty degreaser and cleaner. 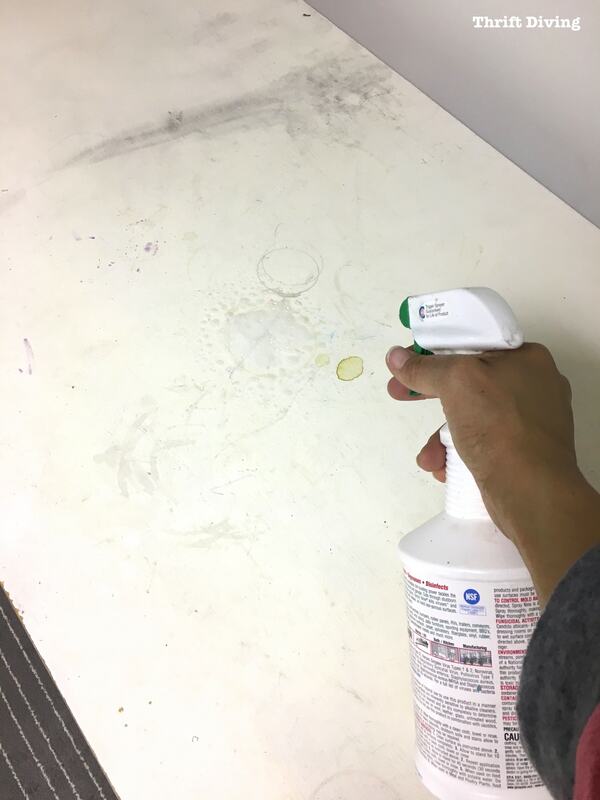 If you’re painting your desk, use a degreaser like Spray Nine or Simple Green first, so that the surface is ready for paint. If you’re not planning to paint or re-paint, then just clean it off with soap and water, or use a wood cleaner for solid wood surfaces. Read: What’s the Best Paint for Furniture? The PROs and CONs of Each. However, I was freshening up my desk with a couple new coats of paint. I simply used off-white paint I had on hand (I had this old container of Annie Sloan Old White paint in the garage. Man, it was pretty beat up! LOL). It looked like a pretty good match, so I went with it! When I use paint brushes, my favorite are synthetic Purdy paint brushes because they give a smoother appearance than natural bristle brushes. Starting at one end, I smoothed on a coat, making sure it was not too thick. 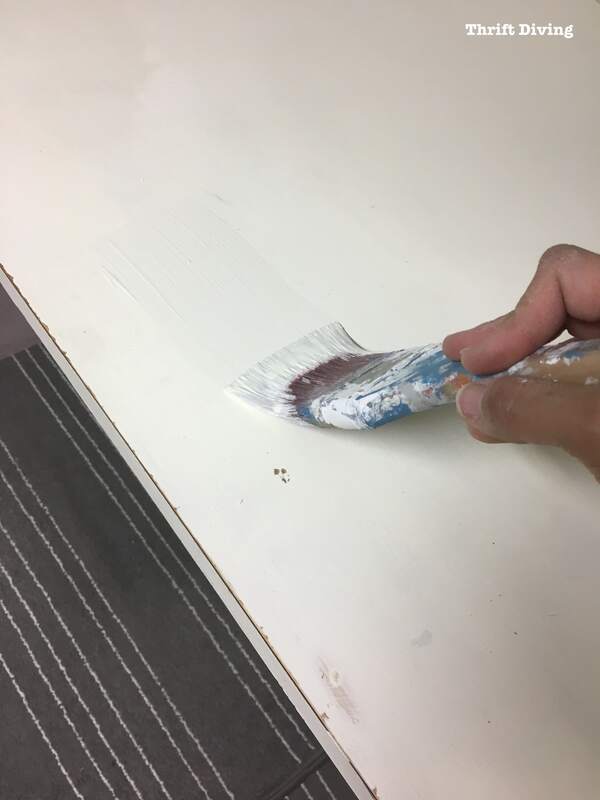 Remember: the thicker the paint, the more time it takes to dry. 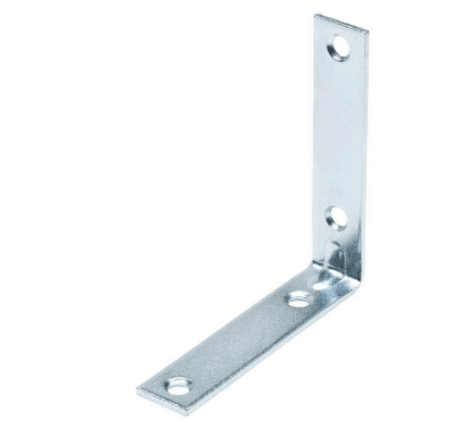 Thin coats allow it to dry more quickly and achieve better results. It’s always best to have two thin coats versus one super thick coat! The file cabinets were in horrible condition, too! When I painted them back in 2015, I had never waxed them or add any top coat, so they’d gotten pretty scruffed up over the past couple of years. Thankfully, I had just enough chalked paint left over in the garage that I had originally used on them (which was a pretty, light pink, Annie Sloan Antoinette). 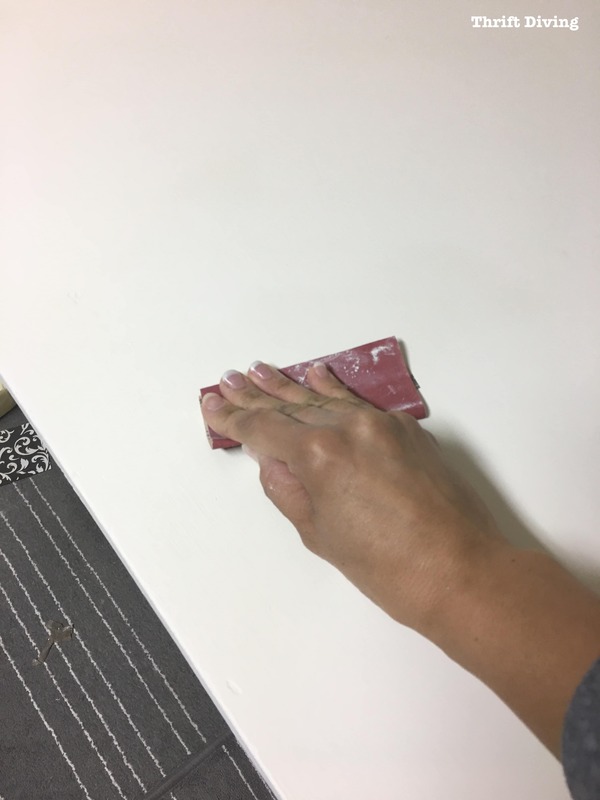 When I use chalked paint, I usually add two coats for better coverage, as I mentioned before. 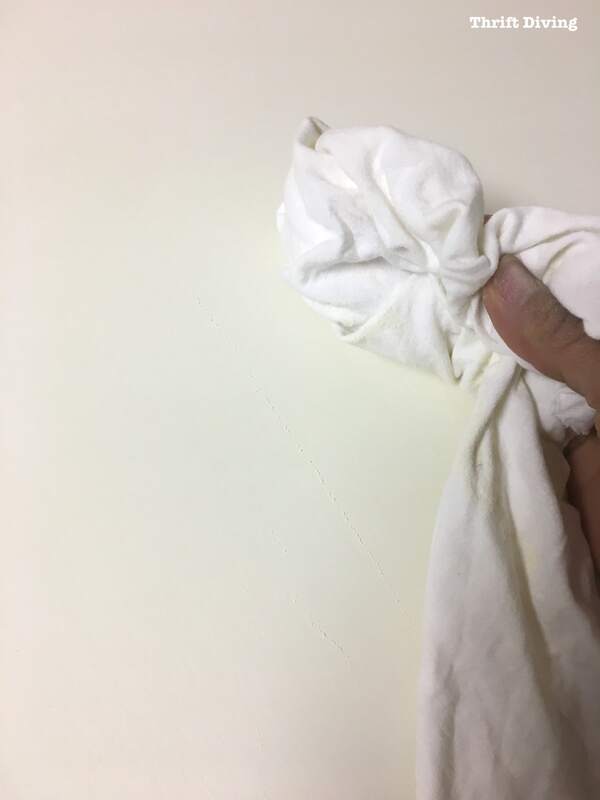 To get super smooth results, it’s best to sand in the direction of the grain (or in the direction of your paint brush) in between those coats, maybe with 320-grit sandpaper. (TIP: Use a dust mask when sanding). Just be sure to wipe up all the paint dust so it doesn’t get into your second coat. I love using the lint-free “t-shirt” type rags that you can buy in 1-pound packs from home improvement stores. I’m sick of clear wax on painted furniture. The reason why is because (at least, for me) it tends to be streaky. Plus, in 6 months, you’re supposed to reapply it. If you are waxing your desk, it will take less time. However, I used a water-based top coat, which takes a little more drying time in between coats. 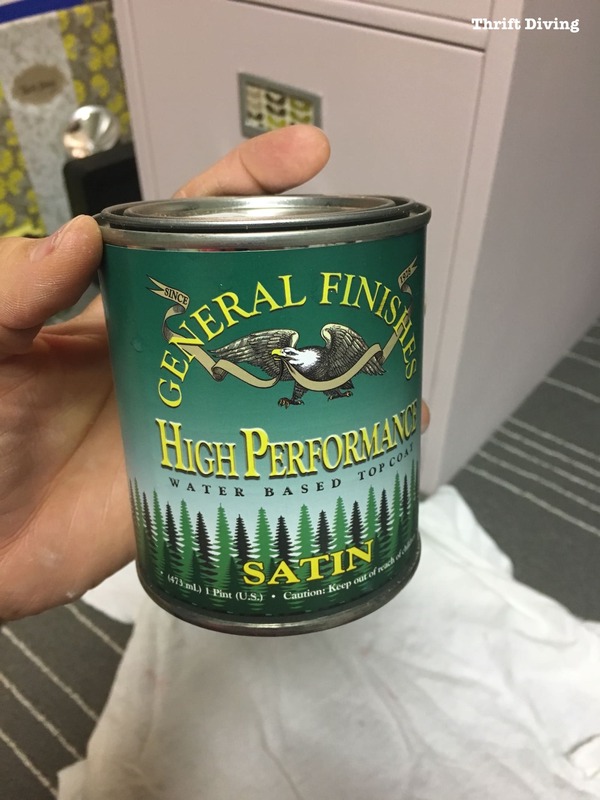 I went to the woodworking store a couple weeks ago and they highly recommended General Finishes High Performance water-based top coat as a great general top coat. If you check it out on Amazon, you see that it gets excellent ratings there, too. After using it, it’s become a favorite of mine because it makes things look silky smooth! The instructions say to use either a foam brush or a paint pad applicator, which I didn’t have either. So it was a paint brush for me (I used a synthetic Purdy brush). Trying not to over-saturate the desk, I added two light coats, working quickly because it dries fast. I tried overlapping the previous section on each pass and making long strokes to keep it consistent. I had a little trouble with the first coat looking a little blotchy but the second coat I made sure to add a bit more to the brush, working faster, and doing reeeallly long strokes to even it out. 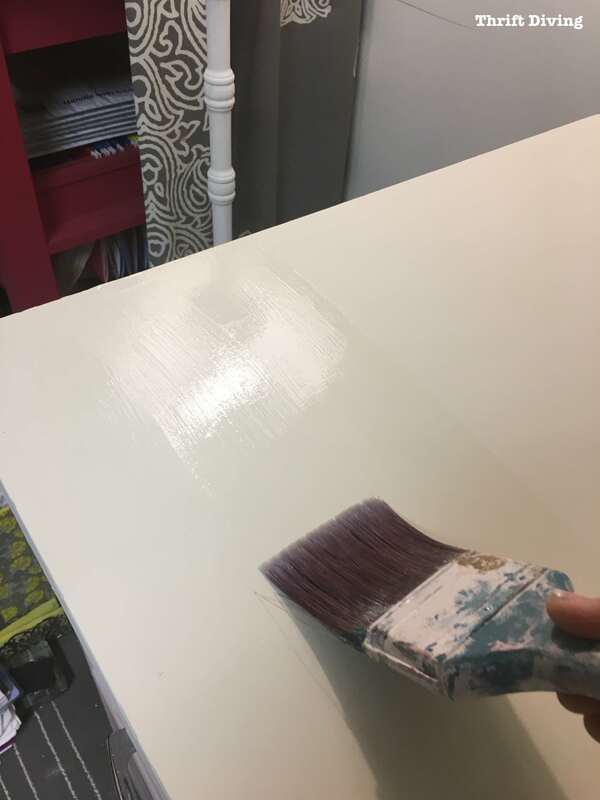 General Finishes recommends a minimum of three coats with about 2 hours drying time in between each coat and then sanding in between coats with 320- or 400-grit sandpaper to help smooth it out. I didn’t follow those instructions, either. I didn’t bother to sand but probably should have. Still, the results were good. 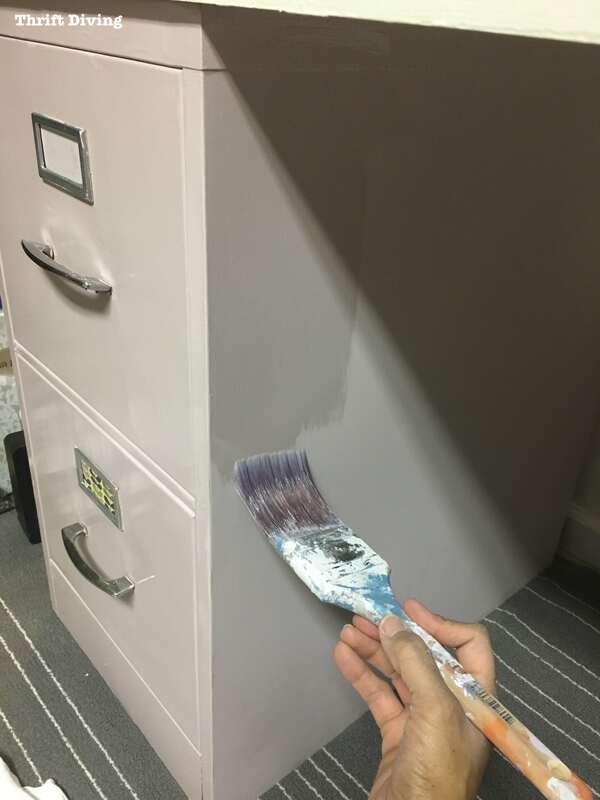 I loved the little bit of satin sheen it gave to the file cabinets! 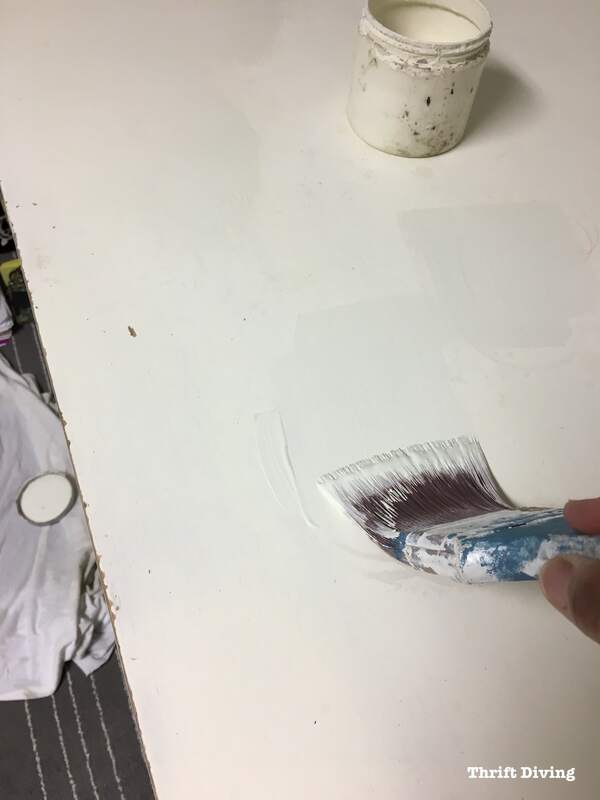 (Keep in mind that if you are following the top coat recommendations, you’ll have to leave adequate drying time in between the coats, which would require more hours needed for this “mini desk refresh”). When all was said and done, the desktop and file cabinets looked great! I absolute love the hint of shine! STEP 6: Purge Your Files! This was a part of the desk refresh that I hadn’t planned to do. But since everything was drying, instead of watching it dry, I decided to put that time to good use. So I dumped everything out! You might be surprised to know that I did a really crappy job of organizing my business files and receipts for 2016! Printed articles or resources that you don’t remember from where they were printed. Some ideas would be to put them in plastic covers in a 3-ring binder. Favorite artwork from the kids! Tax stuff (of course!) from the last 7 years. Anything that can easily be downloaded online, like bank statements, old bills that have already been paid, etc. Business cards of people you’ll never reach out to (or take a picture of the card and digitally file it away). Magazines that you’ve already read but don’t plan to re-read or keep as resources. Try ripping out the articles that you really loved and putting those in a binder, but toss the rest of the magazine. 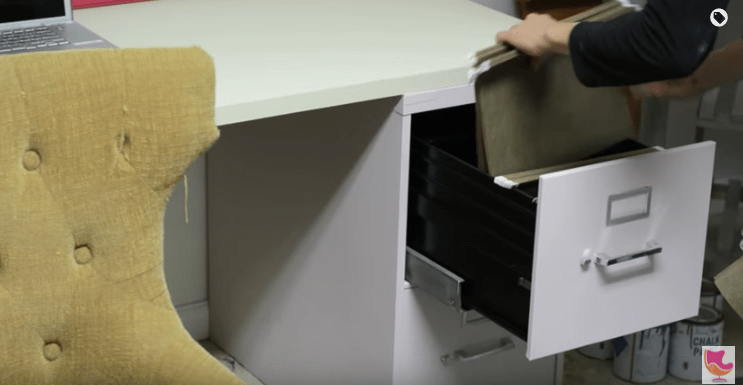 TIP: It’s helpful to have a paper shredder nearby when you’re doing this declutter! 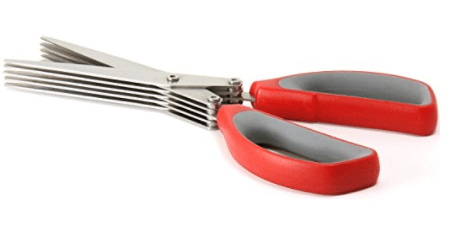 If you don’t have one, you can always invest in a pair of shredding scissors for under $12! You can order them on Amazon (affiliate link). File folders can get expensive! Don’t forget to check the thrift store for stacks of them! That’s where I found a bunch of file folders when I did my office makeover a couple of years ago. During my “desk refresh” I created a folder for every major category of paper that will go into this file cabinet. There should never be a check stub or a receipt sitting out, cluttering your desk! Trust me–that pile always grows! Now, my drawers were two-recycling-bags lighter! I felt so much more clear-minded once it was done! 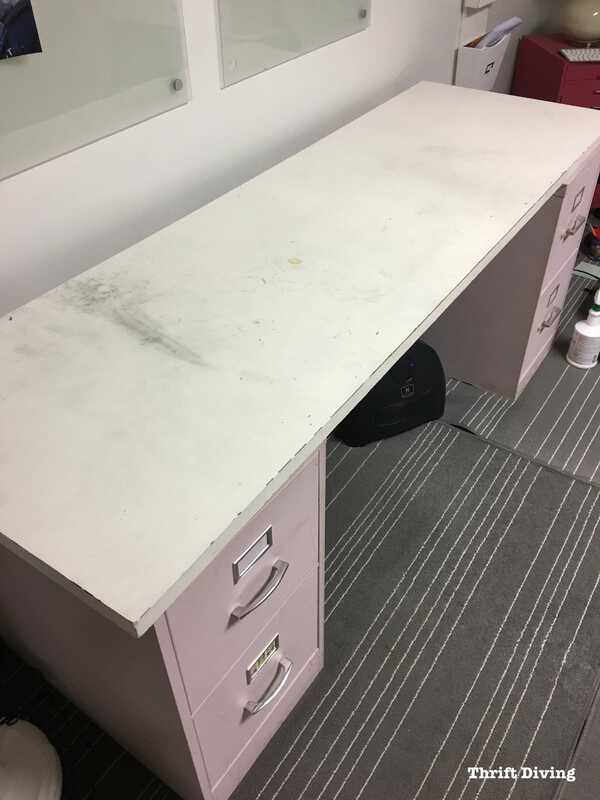 Once the desk was all dry after two coats of top coat, and everything was filed away, it was time to put things back into place. It looked so fresh and clean!! A cheapie Dollar Store monthly calendar so I can write down and see important things coming up. It also helps to keep my arms and pencils off the desk, so hopefully, I can preserve the beautiful top! My little $7.00 thrifted desk lamp to keep the area well lit. A $2.00 thrifted magazine holder help to organize my thicker agenda book and notebooks. A $1.o0 thrifted pen cup. Of course, I added my computer, external hard drives (I’ve got 3 of them! ), a pencil sharpener, and my printer. But all the clutter was gone! LOL, the best way is to not drink at your desk! Come on…how realistic is that?? I do everything at my desk! 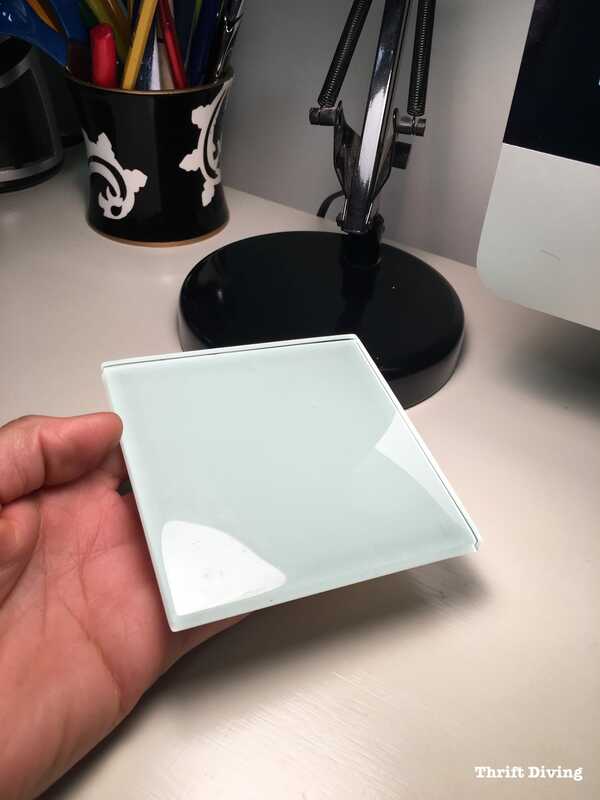 To make sure that I don’t ruin the desk with wine, tea, or coffee stains, I use a single glass tile as a DIY coaster. 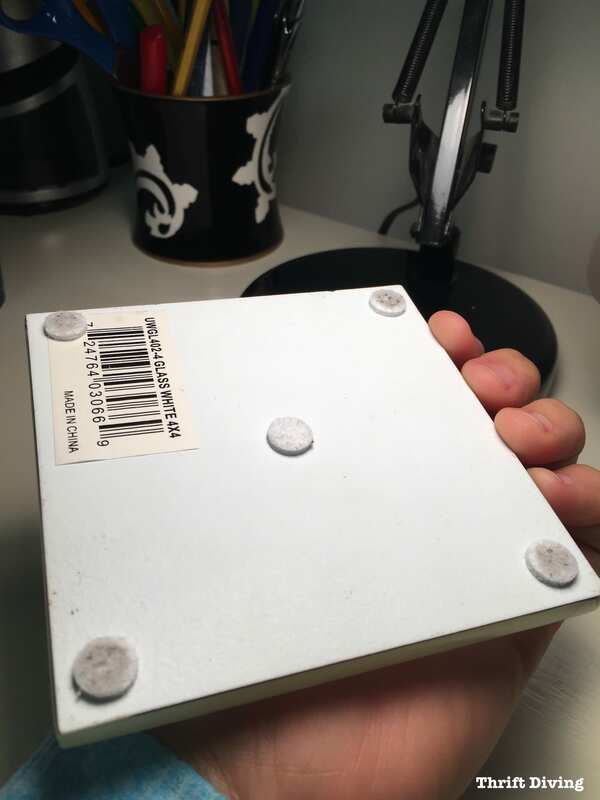 I bought it from Home Depot for a few dollars and added some soft pads so it doesn’t scratch up the desk. 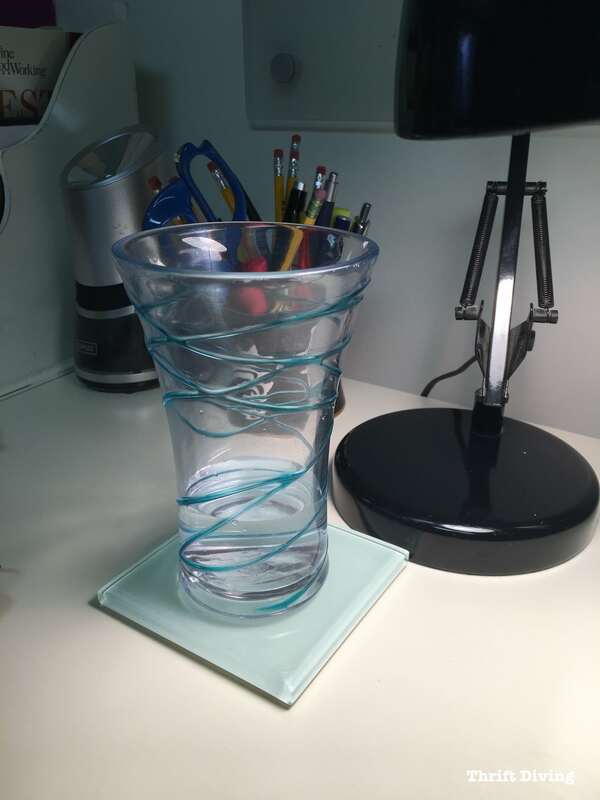 The rule now is that cups must be sat down on my pretty, glass “coaster.” I cannot sit anything on the desk that could ruin it! 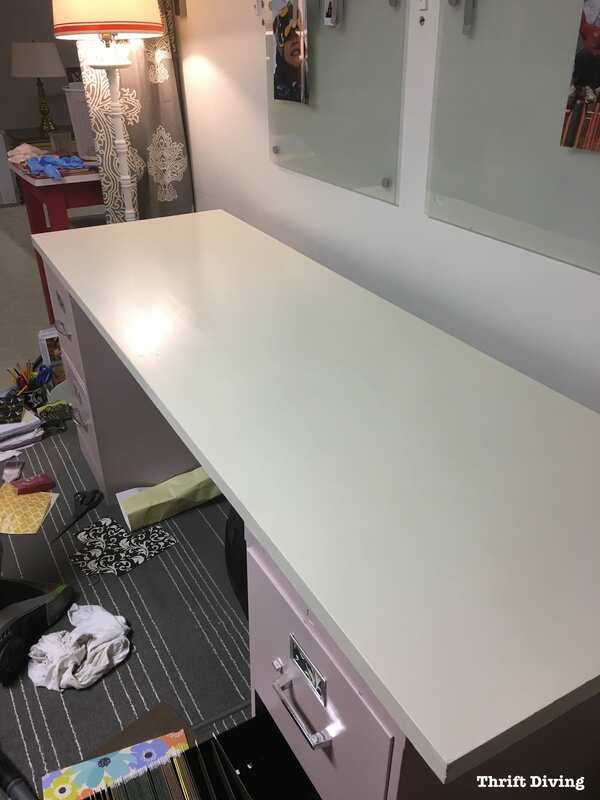 This is a huge difference from where this desk started back in 2015! The top was only $1.76 from a salvage shop, and the file cabinets were $6.99 each! After I freshened it up last weekend, this is how great it looked once it was done and ready for the desk top items again! I’m still amazed that a great desk like this was only $15 to put together! Over time, furniture just gets dirty and stained if you don’t take care of it or if it gets a lot of use, a lot of heavy “traffic,” which was definitely my case! But with a couple coats of paint and top coat, and a little bit of decluttering, it’s possible to have a place to sit and not feel so mentally cluttered! Finally, I feel like I can think and stay focused while I work! Do a mini “desk refresh” once a year. Minimize eating at your desk, or use a placemat. Keep wipes handy and clean often. Use a large desk calendar to protect the sensitive area where it’s likely to get worn by your arms. Use a mouse pad to prevent scratches (I still need to get one!). 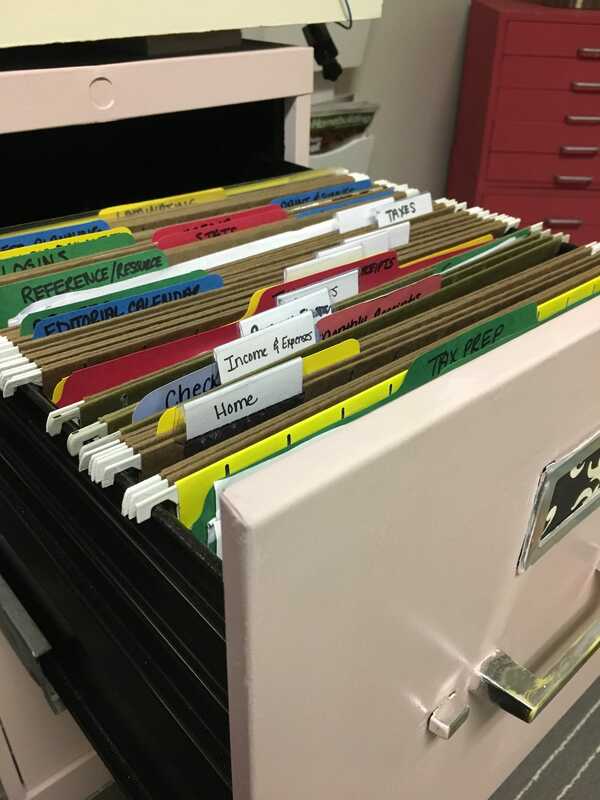 Maintain a filing system so that papers don’t get stored up on the surface. Every time you leave your desk area, make it a habit to clean up and straighten before you walk away. DIY Card Catalog – $12. I found this at the thrift store and painted it white and added card catalog pulls. Pink storage cabinets under the lamp – $40 ($20 each). These easily go for much more brand new, so I was happy to have found them at $20 each and stacked them on top of one another. Huge DIY whiteboard – $40. Whiteboards can be expensive, but not when you make your own! Get instructions on how to make one without any power tools needed. Weave yarn into wood to make DIY wall art – $0. With just a piece of wood, a power drill, and some yarn, you can make wall art! DIY jewelry box turned into a craft organizer – $12. This is one of my favorite projects! Those tall jewelry armoires can easily be turned into a place to hold supplies! I love working down here in the basement! And now that it’s all clean and organized, I feel like I’ve got more breathing room and feel less anxious in my work space! 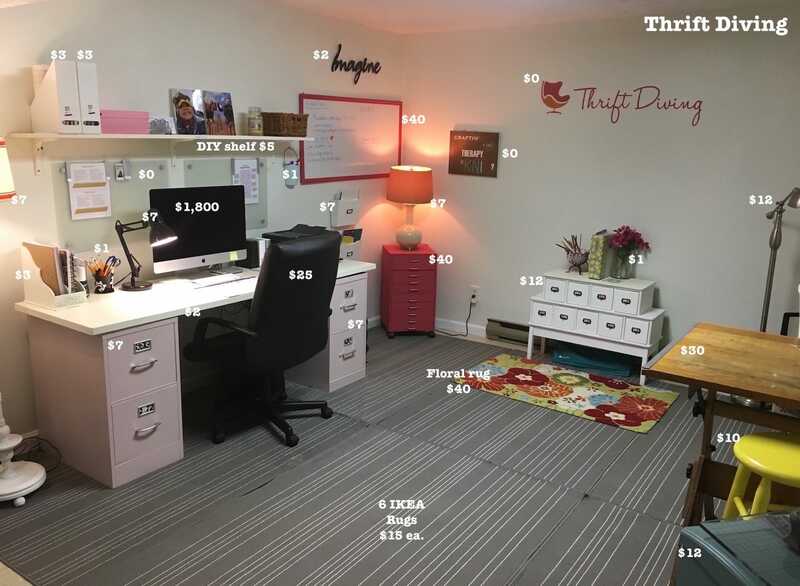 Are you tired of your desk area looking like a hot mess, too? 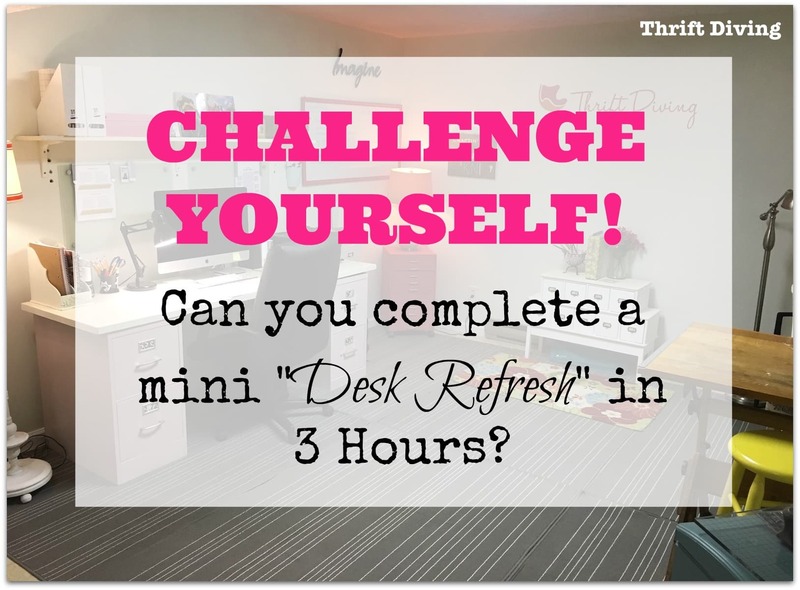 Then I’m challenging YOU to complete your own mini “desk refresh” in just a few hours! Please don’t feel like you have to tackle the whole room! Challenge yourself to do your own “desk refresh” in the next 7 days, and then email me pictures of your desk’s BEFORE and AFTER pictures! 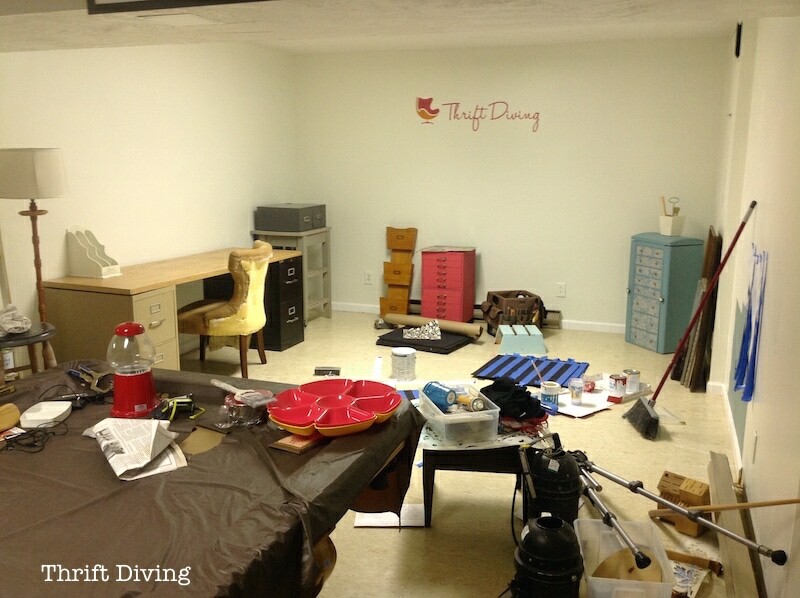 It doesn’t have to be all fancy or anything–it just has to be clean and organized and a place without dirt and chaos! 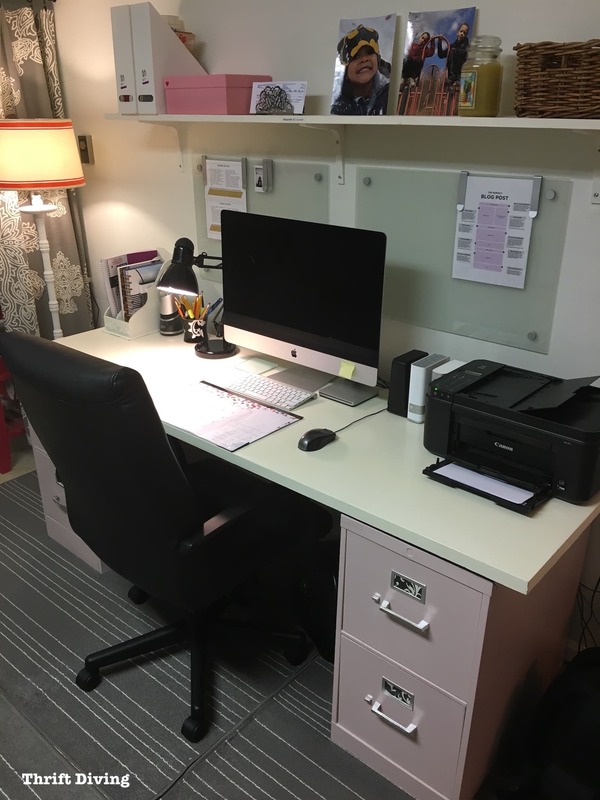 If you accept the challenge, I’ll share your mini “desk refresh” in an upcoming post or in an upcoming email to readers! « Thrift Diving is 5 Years Old! Oh, btw, about a mouse pad – they’re easy to DIY with some corkboard from the dollar store and a fat quarter of fabric in your choice (if you already have the spray adhesive, then this is about $2), or you can get a personalized one from Shutterfly. Shutterfly constantly has discounts and sales, so I was able to get a beautiful heart-shaped one with a high-quality photo of roses on it for about $6. Not bad. =) Anything to save your new paint job, right?? Ooh, thanks for the info! I forgot about Shutterly! I always forget to check them. Then again, making my own would be more fun. 😉 Thanks for the tips! I love it!! Soo gorgeous, and I love how in-depth this is. I think I must have read every single paint tutorial in the universe (no, this is only a /slight/ exaggeration). I know the protocol: thoroughly clean and sand the piece beforehand (working your way up from low grit to high grit), use a good quality paintbrush (Purdy or Wooster), add a capful of Floetrol to the paint, don’t use too thick of coats, brush it on in the direction of the grain, don’t put it under a fan, sand with a high grit sandpaper between coats, allow for plenty of dry time between coats, seal after it’s dried, don’t put anything on it until it’s cured… etc! So why is it I can’t get any piece to look nice? =( All of my streaks are visible, and I’ve used everything from a DG paintbrush to a nice synthetic Purdy paintbrush (weirdly enough, the Dollar General paintbrush was awesome??). The Purdy one only seemed to push paint around rather than actually brush it on, and no matter how careful I was, or how gently I tried to feather out the brushstrokes… they were still there! Argh! I even tried rollers, but every one I tried (from cheapo Walmart semi-smooth to smooth foam rollers to, again, Purdy mohair, which I heard got great reviews) gave me “roller texture”. Love your thriftiness here, too. Your office sounds like my house. =) Don’t you just love it when someone donates like 30 binders and file folders?? Bless kids who have outgrown school supplies. GF gets such great reviews, I really ought to try them one of these days. How do you think they compare to Minwax’s Polycrylic? Bookmarked! Well, my furniture still has brush strokes, too! 🙂 I don’t mind them because it doesn’t make them look too shabby chic. But here’s what I can tell you: I went to a blogging conference a couple years ago and one of the brands there was from Annie Sloan. 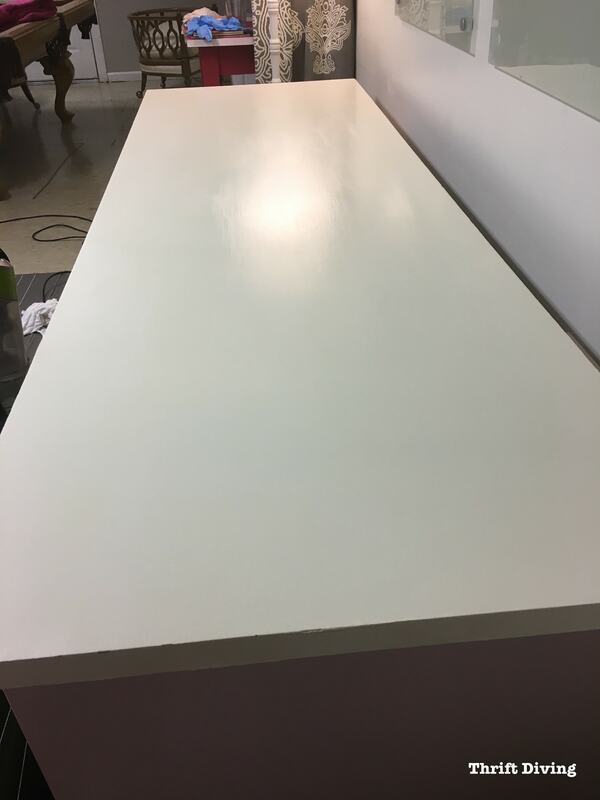 They had this table there in the booth for display and OMG, the finish was PERFECTLY SMOOTH. I couldn’t get over how smooth it was. And I asked her how she did it. She said that she watered the paint down and added 7 layers. Yes, SEVEN! This looks great! I don’t have a desk area at home yet, but I definitely need to clear my work desk off and tidy it up. refreshing and practical, I noticed the chair in the first picture was not the picture in the final. Did you replace it? That’s the prettiest little office! 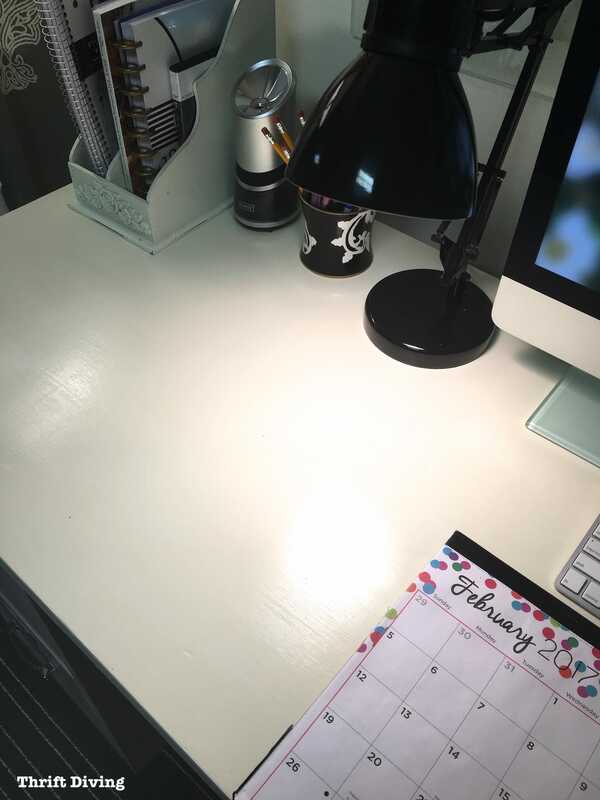 Love how it looks now & so impressed that you created a beautiful desk for only $16! Genius to use 2 filing cabinets as the “posts” holding it up and yet they are useful! I’m not taking part in the challenge, but I admire what you’ve done!